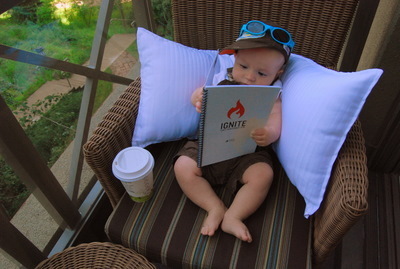 Every few months, Jason writes up a newsletter to send to people who are interested in his ministry at Power to Change. This newsletter includes ministry stories from Athletes in Action and TruthMedia, as well as some personal updates about what we’ve been up to this summer, and how life as parents is going. View the PDF here. Wow, how quickly this time has gone! Shannon and I are now in our final week here in Burkina Faso. The last couple of weeks have been busy wrapping up, so I thought I’d post a quick overview. On Friday, April 10th, the Center for the Advancement of the Handicapped (where I work full time and Shannon has worked a day a week) had a little goodbye party, since that was my last work day. Everyone was incredibly kind, and Shannon and I felt very privileged to have been able to serve this group. On Saturday, April 11th, we hosted a big goodbye party at our house for all the friends we made in Mahadaga. We gave invites to the medical clinic and the Center, our two places of work, as well as to our church friends. We expected maybe a 50% turnout rate, like a party back home, but people warned us that when a white person has a party, EVERYONE shows up! It turned out they were right, with about 80 people coming to our house between 11 am and 5 pm. Several of the locals and Florence, one of the other missionaries, cooked up tons of rice and sauce for us to feed everyone, and Shannon baked MANY dozens of cookies and cut up lots of mangos. We managed to go through the whole party without running out of food, and it was a wonderful way to say goodbye to everyone. We waved goodbye to Mahadaga for the last time on Monday, April 13th, as we drove off to Fada for a short visit. There is another mission station there, and we wanted to spend a bit of time with the missionaries we had gotten to know there before leaving the country. A few days later, we continued up to the capital, connected with 5 other short-term SIM missionaries, and headed off on a 4-day visit to Djibo which we had been planning for several months. Djibo is a large town/small city in northern Burkina Faso, close to the southern frontier of the desert. It’s known for being hot, isolated, and a difficult place to minister. We went to visit the missionaries there, and to learn about the church planting that is being done among the Fulani people. This people group, we learned, is actually the LARGEST unreached people group in the world! (By unreached, I mean they don’t have a growing, self-sufficient Christian church in their own culture.) They are a stoic people, who think it’s weak to show any kind of emotion. They are spread across western Africa, and are almost entirely followers of Islam (although they often mix Islam with their traditional animistic practices). We had the opportunity to visit a Fulani pastor who has just moved to Djibo, visit a traditional Fulani village and have a meal in their home, and visit the small Fulani church that the missionaries are working with. It was quite fascinating, and helped open our eyes to the needs. Please pray with us that God would open the hearts of the Fulani to know Him! Pray as well for the Fulani pastor we met – it’s quite tough for him when Christians often become social outcasts from the rest of the Fulanis. While in Djibo, we also got introduced to the Tuareg people. The Tuaregs are nomads, who typically live in Mali. However, the Tuaregs have been engaged in a struggle with the Mali government for quite some time now, and many Tuaregs have left Mali as refugees from the fighting. We had the privilege to visit a Tuareg camp, have a meal with them, and even take a short camel ride! 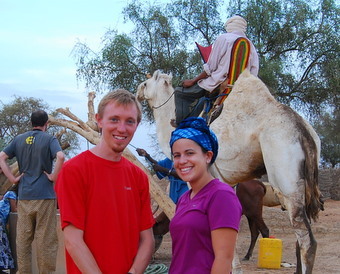 Here’s a picture of Shannon and I with the camel in the background. Our last week here will be planning and preparing for our time in Europe and our time in Ontario. We will be taking a 3.5 week trip through Italy, France, Spain, and Morocco and are excited to get the chance to see Europe for the first time! We are scrambling trying to book everything even now and also hoping to prepare some presentations for when we return to Canada. We are also getting the chance to visit with missionaries here on the field for one last time and are getting the chance to see some ministries here in Ouaga. Please pray for our continued protection and that we make all our connections in Europe! Please pray also that we finish well here and have opportunity to bless the different missionaries here. We look forward to connecting again with everyone back at home! “I’ll pick you up between 6 and 6:30 am”. 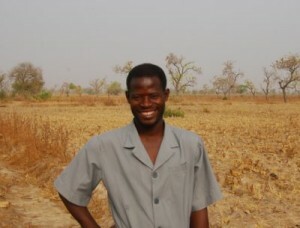 I (Jason) had just been talking with our local Pastor about wanting to go see his field, where he grows staple crops of rice and millet in the rainy season. He was happy to give me a little tour, and said we should go before the day got to warm. So, just as the sky was starting to go from black to grey, I pulled myself out of bed to get ready. When the Pastor arrived on his moto, I hoped on the back and held on for the ride. The field is a ways back from the one main road, and about a 15 minute ride from his house. He told me there wasn’t much land close to the road, so that’s why he couldn’t grow his crops close to his house. I asked why he didn’t build his house back by the field, and he said it would have made it very difficult to get water, since the nearest well was several kilometers away from his field. After taking several successively smaller paths (and getting me thoroughly lost), we pulled up to a mud house compound and parked. “My brother lives here”, the Pastor told me; “We should go greet him”. Of course, how could we visit the area without stopping to see the people he knew in the area! I guess they chose to put up with the difficulty in getting water, so they could live closer to the field. After stopping in to say hi for a few minutes, we continued on to the field. Unfortunately, since we are near the end of the dry season right now, the fields are mostly just hard, cracked furrows of dirt with the remains of last year’s stalks in the ground. But, just by looking at the size of the fields, I could see that it would be a big job for one family to till the land, sow the seed, tend the crops, and then harvest them, all by hand! “During the rainy season, I’m out here in the field from about 7 in the morning till sundown, just after 6”, the Pastor told me. He still has to work on church activities like his sermon after that! He asked me, “Do pastors in Canada have to grow food or have another job to feed their families?” I know there are a few who do, but it’s pretty rare. We are so blessed in Canada! It seems that EVERYONE here has a field – even a family that seemed quite well off, where both of them have decently paying jobs (one at the medical clinic, one at the handicapped center) had a field. They said they needed to grow some of their own food to survive! I’m not sure how people like the pastor are able to actual get money for things like gas for his moto, since he doesn’t really grow enough food to sell – mostly just to feed his family for the year. As we wandered to the far end of the rice field, the Pastor pointed out a small barrier he had constructed last season to keep the water from draining so quickly off the field. The dirt is really hard (especially when dry! ), so it was a tough job to build up a barrier like that. Fortunately, he does have one steer to help with some of the plowing and other work. He’d like to buy another so he can add some more barriers next year and keep his fields better watered, but it’s quite expensive for a steer and he doesn’t have the money. His wife comes to help in the field during the rainy season a lot as well (I’m not sure what she does with their 2 kids, though!). I asked when kids start learning to cultivate fields, and he said when they around 10 or 11. So, maybe they’ll be helping out soon enough! On our way back from the field, the trail we were on passed right beside a circumcision camp. This is an annual tradition here. Boys who are deemed by their parents or older siblings to be ready for the transition to manhood go out to these camps for about 3 weeks. They learn a bit about farming and other skills. However, the camps are also animistic (following the tribal religious traditions) and cause quite a few problems in the community. The boys dress up in masks (they are not supposed to be recognized, now that they are “men”), spread sand and clay on their shirtless chests and arms, and run around in the village with sticks demanding money from people. They are known to hit women and children with the sticks they carry around, and many people are quite scared to go out when the circumcision camps are going on! It’s prevented people from going to central locations where Shannon and other nurses from the clinic were giving vaccinations, and kept some kids from coming to hear Betty (another missionary on the station) do the Bible stories she does several times a week in various housing compounds around the village. A girl even had to go to the clinic last week to be treated after having been hit by these circumcision boys! One time, I noticed a number of kids crowding on our porch, peeking around the corner of our house. I asked what was going on, and they told me some of the circumcision boys were coming. When the boys came through the front gate of the mission station, about 100 feet from our house, the kids were so scared they ran straight into our house, which has always been off limits for them! Fortunately, I just went out and told the boys to leave, and they didn’t give me any trouble. Anyway, as we were approaching the circumcision camp, about 30 boys (all early teens I think) started getting up and running to block the path. As we got closer, they started chanting and hitting their sticks together. Needless to say, I was a little nervous! Fortunately, the Pastor didn’t seem too concerned. He pulled out a bit of money to give to one of the adults leading the camp, after which the kids applauded and let us through. That was definitely a close encounter with a very different side of the local culture!